As I write this, the world is watching and holding its collective breath as valiant attempts are being made to rescue a dozen young soccer players and their coach from a flooded cave in Thailand. Those boys, their parents, and their coach must have spent many hours in the past two weeks thinking, “Had a family once,” and praying they’ll still have their families intact when this ordeal and rescue is over. My interest in genealogy and local history recently led me on a fascinating trek into the lives of some people of African descent who were slaves in Cabarrus County, North Carolina in the 1800s. That sounds like a long time ago, but it really isn’t when you think in terms of a person’s lifespan and generations within families. Caroline had a family once. In the records of Rocky River Presbyterian Church, Caroline, infant daughter of slaves Nat and Marie owned by R. Biggers, was baptized on August 16, 1835. Caroline, a slave of George Leroy Morrison, joined the church April 29, 1859. Was this the same Caroline? Yes, she was! There is a bill of sale dated October 30, 1856 in which a 22-year-old woman named Caroline and her two children (Robert, aged about four years and an unnamed infant about three months old were sold by Rebecca Biggers to George Leroy Morrison. The idea of slavery is repulsive, but seeing an actual bill of sale makes me physically ill. Having this information, I owed Caroline a few hours of my time to try to determine if she survived to be free after the American Civil War. What I was able to piece together was surprising and thrilling. In 2004, I compiled a list of the records of the more than 900 slaves who were baptized at and/or joined Rocky River Presbyterian Church between around 1820 and the end of the Civil War in 1865. The 1863 Cabarrus County Tax Assessment List gave details about some of those slaves such as age, physical condition, and monetary value. George Leroy Morrison died May 6, 1860. The 1863 Cabarrus County Tax Assessment states that his brother, Q.C. Morrison was guardian of four slaves: Abram, aged 45 and valued at $1,100; Caroline, aged 26 and valued at $1,400; Robert, aged 9 and valued at $900; and Matt [name was probably Nat] aged 1 and valued at $100. Q.C. Morrison died in the Civil War on August 7, 1863. According to the 1863 Cabarrus County Tax Assessment, Rebecca Biggers had a 55-year-old slave named Nathaniel. He was valued at $100 with the notation, “cripple.) Rebecca did not have a slave named Marie at that time, but we know from church records that Nat and Marie were Caroline’s parents. Armed with that information, I wanted to know more. I wanted Caroline to survive the War, gain her freedom, and have a life. She’d “had a family once.” Did she have that same family after the War? The 1870 US Census of Cabarrus County, Township One finds Caroline, wife of Albert Morrison, along with children Robert, Nathaniel, Edward, and Albert. According to the agriculture schedule of the 1870 Census, Albert and Caroline Morrison owned 40 acres of improved land valued at $200 along with farm machinery valued at $15. They owned livestock valued at $100 and reported how many bushels of wheat, Indian corn, and corn they had raised in 1869. And, by the way, Albert Morrison was one of the five elders elected at the founding and organizational meeting of the African-American church that was formed by former slaves who had been members of Rocky River Presbyterian Church. Originally called Rocky River Colored Presbyterian Church, it soon became Bellefonte Presbyterian Church and is still going strong in Harrisburg, NC. The next time we find a record of Caroline Morrison is in the Cabarrus County, NC Wills and Estate Papers. “The widow Caroline Morrison & family” of seven children received a one year’s dower on March 30, 1876. Caroline Morrison is the head of a household in Township One in Cabarrus County, NC when the 1880 federal census is taken. Sons Edward, Albert, Eugene Mc., and John are in the household along with Caroline’s granddaughter, Harriet. I won’t go into all the details of the rest of my research into the life of Caroline Morrison. Suffice it to say that I found marriage licenses for her sons, Nathaniel A. and Albert. Albert (Jr.) and his wife and children are in the 1900 US Census. I even found a 1925 death certificate for Albert (Sr.) and Caroline’s son, Robert. He was employed at the Southern Railway Railroad Shop in Forsyth County, NC. Did Caroline have a family? Yes, she most certainly did! There’s no telling what interesting history tidbits I’ll uncover. I love this stuff! I hope you have a good book to read. I’m reading Educated: A Memoir, by Tara Westover and several other small nonfiction books. If you’re a writer, I hope you have productive writing time. I didn’t work on my novel last week, but I had a rewarding time researching Caroline Morrison and writing about my findings. I’m trying something new today. Monday is the day that I get weekly digests of the blogs I follow. I tend not to be very productive on Mondays, so it is a good day for me to read what other bloggers have to say. I follow a variety of bloggers from around the world – USA, Scotland, France, Australia, Egypt, England, Canada, India, Norway, and South Africa. I follow the blogs of other writers, as well as a young man who is a music composer, photographers, historians, pastors, stay-at-home mothers, a father whose daughter died of cancer at the age of 19, and an autistic man in the United Kingdom. This afternoon I found a blog that was new to me: https://dailypost.wordpress.com/challenge-instructions/. The site offers a writing prompt every day. I’ve never done much with writing prompts, but this might be a way for me to blog more often than my usual Tuesdays and Fridays. It has already prompted me to do a little writing on a Monday, which is an accomplishment in itself. Today’s prompt is the word record. Right off the bat, I’m faced with the decision of whether to use record as a noun or a verb. I chose to use it both ways. I immediately thought about the daybooks one of my great-grandfathers kept in which he wrote daily from 1891 until his death in 1914. His daybooks (or journals) are a RECORD of life on his farm in Mecklenburg County, North Carolina. What a gem for his descendants! I wish he had RECORDED more current events. He had fought in the American Civil War, so on the anniversary dates of the battles in Richmond, Virginia, and New Bern, North Carolina were always noted. Lee Dulin kept a daily RECORD of the weather and that day’s activities on the farm. He was a widower raising six children, his wife having died in childbirth in 1881. Trips into Charlotte for supplies were duly noted, as was his trip by train to the 1895 Cotton States and International Exposition in Atlanta. A man of few words, though, he merely wrote down the day he left for Atlanta and the day he returned. It was probably the first time he saw electric lights, but we’ll never know. He didn’t write about anything he saw at the event, which was very much like a World’s Fair. 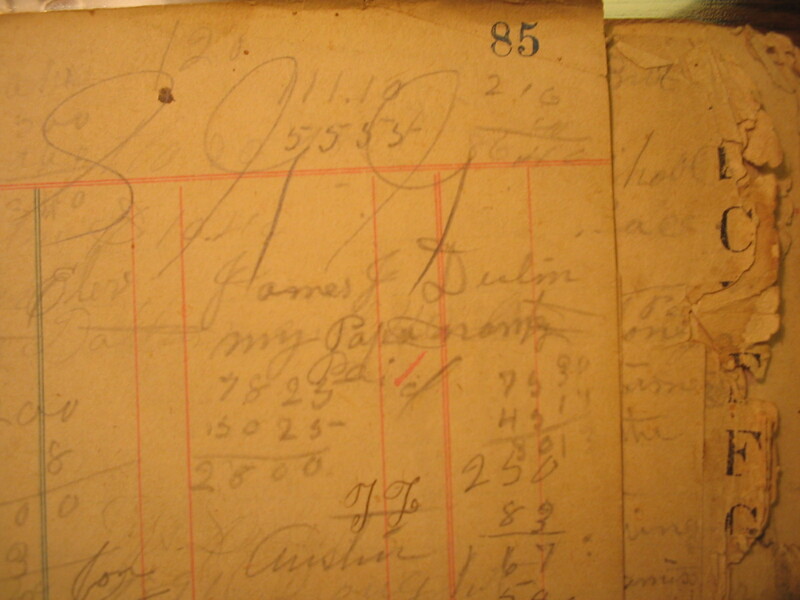 Photo of part of a page of ciphering in one of Lee Dulin’s daybooks. In today’s computerized world in which it is said that young adults have no interest in keeping a photograph or a piece of paper, I’m glad I came along in a time when family RECORDS like great-grandpa’s daybooks were valued and saved. Incidentally, I blogged about Lee Dulin’s daybooks a year ago tomorrow, May 14, 2016, in case you want to read more about it. I hope you have a good book (or an ancestor’s daybook) to read. If you’re a writer, I hope you have quality writing time. Today’s post is a tribute to Edith Wharton on the 154th anniversary of her birth. She was the first woman to win the Pulitzer Prize for Literature. She won the award in 1921 for The Age of Innocence. I believe her 1911 novel, Edith Frome, was the first novel I read. It made quite an impression on me. Ironically, Ms. Wharton’s mother forbade her to read a novel until she was married! Ms. Wharton was born into the upper-class in New York City during the American Civil War, and her family moved to Europe to avoid the toll the war was taking on the United States. She was more suited to life in Europe and died in France in 1937.